How should adult leaders spend their time at camp? Here are some tips. There is a place where adults voluntarily give up a week of vacation to oversee a bunch of teenage boys. Some might call these people crazy... at Camp Minsi we call them Scout leaders! 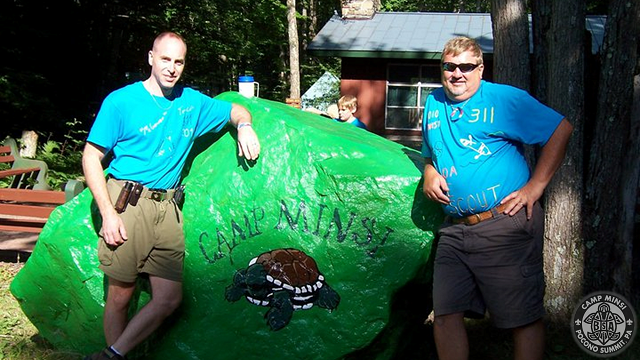 At Camp Minsi, the camp staff handles the daily programs, teaches merit badge classes, and even prepares the meals. So what’s a Scoutmaster to do? 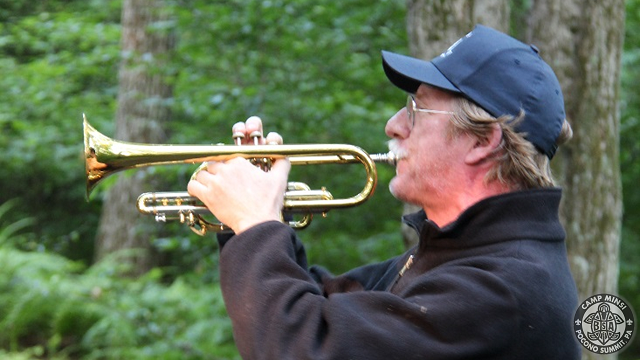 Here are our top eight suggestions for how adult leaders can spend their time at Camp Minsi. Camp removes the hustle and bustle of the daily grind and the tech-filled mass-information world in which we live. At camp you are able to “unplug” and escape constant phone calls, traffic jams, and demanding work schedules. Take advantage of the time to relax and recharge. What are the three essential items for a Scoutmaster at camp? (1) A comfortable chair, (2) a big coffee mug, and (3) a good book. Take some time to just kick back and relax (just do it somewhere that your Scouts can find you if they do need you). 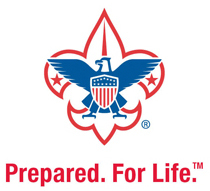 Training helps adult leaders deliver quality Scouting experiences. While at Camp Minsi, leaders can take advantage of their time to get trained. Our qualified commissioners and area staff offer a variety of adult leader training opportunities including: the BSA’s Position Specific Training, Introduction to Outdoor Leader Skills training, Safe Swim Defense, Safety Afloat, Swim & Water Rescue, Paddle Craft Safety, Chainsaw Safety Training, Leave No Trace Awareness, and American Red Cross First Aid & CPR/AED training. Your week at camp is a great opportunity to get these essential trainings completed (check out the camp's Program Guide for more details). Boy Scouts is a boy-led, boy-run organization. One of the Scoutmaster's most important responsibilities is to provide direction and coaching that empowers the boys. Summer camp is one of the best places to sit back and let the boys run the show. Remember that this is their week at camp. See that they understand what needs to be done but then step back and observe from a distance. Check in with them and ask questions, but try to only intervene when it is asked or it's matter of safety. 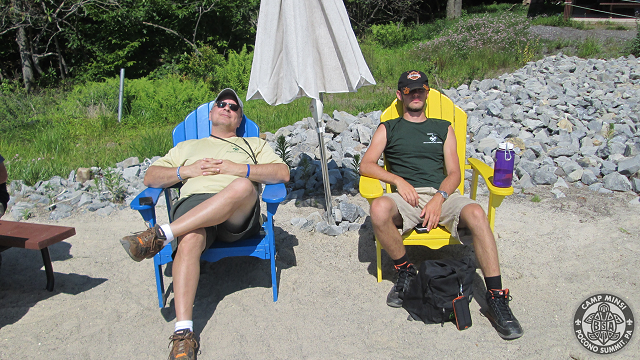 If you have a boy-led troop then a Scoutmaster really has a week of vacation – the SPL will take care of stuff, and if they can’t, they’ll know where to find you relaxing (see item #1). 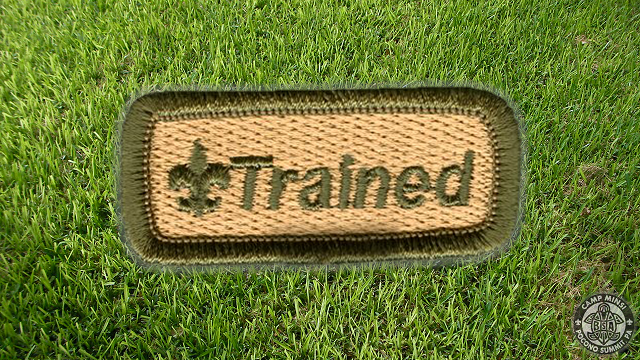 Who said that Scouts are the only ones who can earn badges at camp? 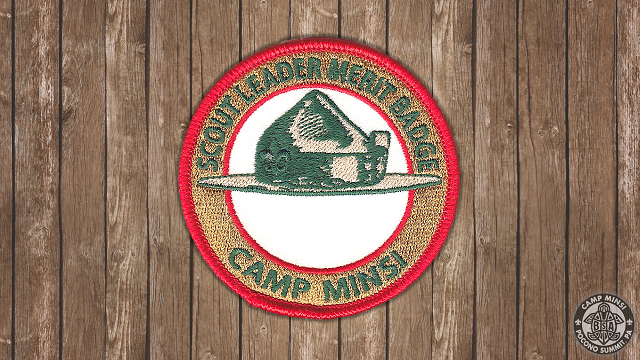 Camp Minsi’s Scout Leader Merit Badge is a unique award just for adult leaders. What better way to set the example for your Scouts than by challenging yourself to earn a badge too? 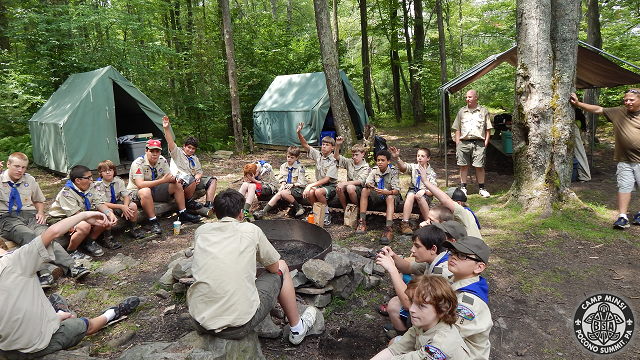 The Scout Leader Merit Badge program encourages leaders to get out of their campsite and participate in a variety of fun activities throughout camp. There are multiple levels to the program, so even returning leaders will have new requirements to face each year. You can pick-up the requirement sheets from the Program Director during your week of camp. Being at Camp Minsi is being part of a camp community. 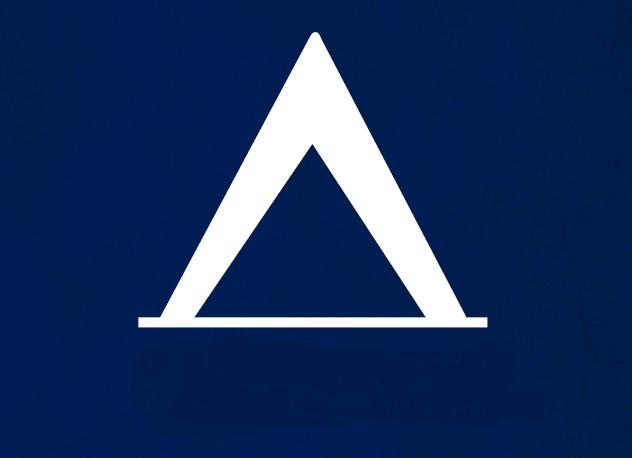 We’re sure that you have skills that could improve the camp experience for others. There are lots of ways you can get involved and give back – whether it’s bringing your expertise to a merit badge class, assisting the camp ranger with a maintenance project, serving as a lookout at the Waterfront, or simply lending a hand sweeping the dining hall. Use your talents to help strengthen the program and improve the experience for the Scouts at Camp Minsi. Talk to the camp staff to find ways (whether big or small) that you can be part of the team during your week and play an active part. 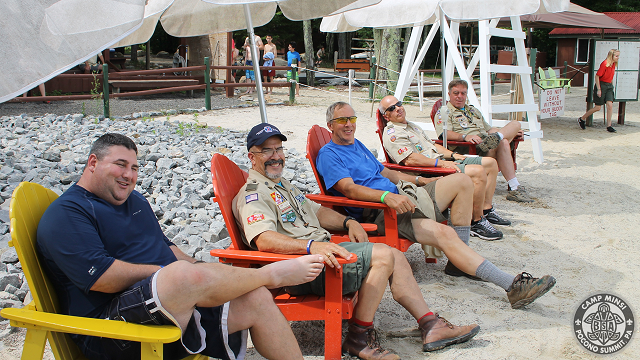 Summer camp is a great opportunity to meet other Scout leaders from other units. Take advantage of this opportunity to share experiences, trade ideas, and enjoy fellowship with other Scout leaders. You might just be able to bring some great new ideas back to your troop, uncover new resources, and (best of all) make new friends. A lot happens during a week at summer camp – skills are learned, badges are earned, adventures are had, friendships are formed, conflicts arise, and character develops. There are struggles and there are successes. Adult leaders can develop respect and trust with Scouts as they teach skills, share knowledge, and mentor. 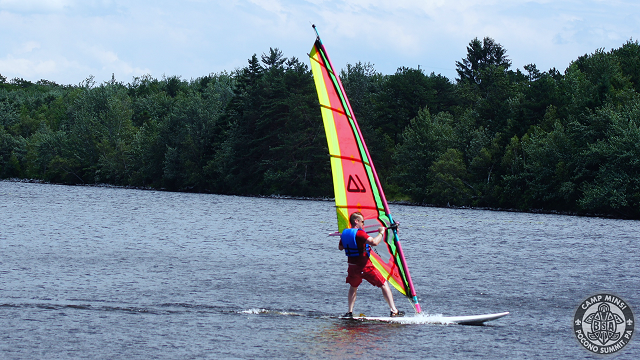 A week a summer camp is a great opportunity for a Scout leader. Check in with your Scouts throughout the week – ask them questions, listen carefully, guide and mentor them. 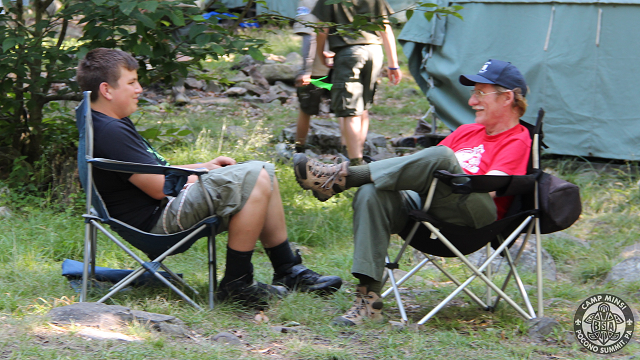 Summer camp is a great place for informal Scoutmaster conferences. Be proud of your Scouts, encourage them, congratulate them, respect them, and support them. You’re at summer camp after all... so have fun! There is lots of great things for leaders to do at Camp Minsi. Go boating, swimming, sailing, fishing, shooting, hiking, or biking. Play games. Sing songs. Go on the Muck Hike or an Afternoon Adventure. Enjoy the beauty of Stillwater Lake. Take advantage of all the great opportunities to be a kid again. Your attitude is contagious; so if you're smiling, then it's almost certain that your Scouts will be too.